Some people described conditions at an condominium complex in the Baymeadows area of Jacksonville as being similar to living in a dump. 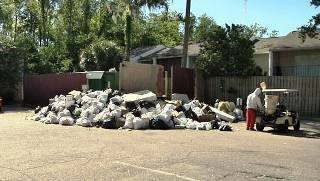 After receiving several calls into the newsroom about piles of trash not being picked up at Sonoma Southside Condominium, News4Jax on Tuesday went to check it out and discovered it wasn't the only issue residents are facing. "This is disgusting," condo owner Beverly Schaff said. "This is gross." Pile of trash flooding the parking lot outside the garbage compactor could be seen at the condo complex on Southside Boulevard. "It's appalling and it stinks," condo renter Zaina Masri said. People living here at Sonoma Southside Condominiums complain the trash hasn't been picked up in more than a week, and it just continues to pile up. They're concerned about rodents endangering their health. Groundskeeper Terry Mims has to clean up the mess. "They should call somebody else at least to help me," he said. Mims has worked at Sonoma Southside Condominiums a little less than a year, and he said the trash has never been as bad as it is now. "Ain't no telling what you'll find in here," Mims said. "I think that's a piece to a car." There were also dozens of open garbage bags and mattresses. "I can't even move it," Mims said. "It's so heavy." Mims said the trash usually gets pick up every two weeks, but things got out of hand. On Tuesday, he was not even able to access the trash compactor to see whether it was full. "There's probably no trash in there. Once the pile starts, people just keep piling and piling," Mims said. For more than a week, trash has been piling up and residents just want it gone. But they also told News4Jax the garbage isn't the only issue they're having at the condo complex. Residents said they've been dealing with leaky roofs and mold. Tarps still cover nearly every building since Hurricane Irma in September. Neither the landlord nor the corporate office would comment. People living at Sonoma Southside Condominiums said it's been a constant problem and their voices are not being heard. "This is disrespectful to the people who pay to live out here," Schaff said. As for Mims, he said management may try to get some dumpsters to hold the trash in the meantime.